Tired of running from her past, nurse Kate Callison intends to become Austin Grace Hospital’s permanent ER director and make Texas her home. Despite staff friction, she’s moving ahead. Then unthinkable tragedy wraps the ER in crime tape, bringing swarms of media, legal chaos—and a search-and-rescue hero who seems determined to meddle in her life. For Wes Tanner, nothing beats finding someone who’s lost; he’s known that helpless terror firsthand. So he’ll expand his team’s lifeline of hope: K9 tracking, swift water rescue, even horse-mounted searches. He’s ready for anything—except Austin Grace’s prickly and dismissive ER director. As Kate and Wes discover more about each other, new respect becomes something deeper. Kate wonders if her heart might have finally found a home. Then an unsolved missing persons case—and a startling new one—become catalysts that threaten the loss of all she and Wes have found. 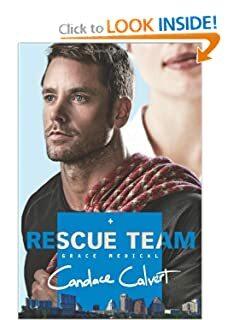 While more religious than some of Calvert's other books, Rescue Team showcases a heartwarming romance between two people who have been both loved and abandoned in their lives, and who have made major decisions in their lives based on the abandonment. Both need to learn to trust each other. Both need to realize that God won't abandon them. Kate's dad is a recovering alcoholic going through the twelve steps, including making amends to those he has hurt. I cheered for him as he dealt with Kate's understandable detachment. Candace Calvert used to be a nurse and manages to put a lot of detail into the hospital scenes. While I have no idea how accurate the scenes dealing with search and rescue are, they are interesting to read. The book is Christian fiction and we watch Kate make peace with God after a lot of years of fighting Him. However, I wouldn't call it a preachy book and unless religion in books is an automatic turn-off, I don't think there is enough religion here to turn off those looking for a clean romantic read.